Fishes are often used as sentinel species for monitoring aquatic environmental health (Franco et al. 2002) because they are greatly influenced by external environmental conditions especially demersal fish as our studied specie. Stress causes in fish a significant release of cortisol (Wendelaar 1997) which has negative effects on various physiological functions (reproduction, growth, immunity) if they are maintained over time (Pottinger & Pickering 1997). Early detection of sub-lethal effects may permit biologists and resource managers to take remedial actions that could prevent further habitat degradation and population declines. Thus, there is great interest in understanding and monitoring sub-lethal biological responses that are faithful indicators of environmental quality (Allenbach 2011). One morphological trait that has been linked to habitat alteration and environmental stress is ﬂuctuating asymmetry (FA). FA is deﬁned as small, random deviations away from perfect bilateral symmetry. This deviation from perfection is thought to reflect the genetic and environmental pressures experienced throughout development, with greater pressures resulting in higher levels of asymmetry (Palmer & Strobeck 2003). Thus, signiﬁcant increased levels of FA in a population may indicate that individuals have difﬁculty to maintain precise development, resulting in negative effects on the population over time (Markow 1995). Measurements of FA have become a popular technique for quickly and inexpensively examining sub-lethal stress and FA has been examined in a variety of taxa. In ﬁsh, stressors range from general (physical habitat changes, urban inﬂuence, undeﬁned or mixed stressors) to speciﬁc (heavy metals, temperature, radiation, acidiﬁcation, pesticides) (Allenbach 2011). Although many studies of fluctuating asymmetry in fishes have been conducted in several regions of the world, apart from the study by Mabrouk et al, 2014, no studies using this biomarker have been conducted up to now in Tunisia. In the east of Tunisia, we analysed the fluctuating asymmetry in fish, and asked if anthropogenic disturbance, such as sewage discharge, increase FA compared to unpolluted area. Chosen species is the grass goby, Zosterisessor ophiocephalus (Pallas 1811), a demersal fish species belonging to the Gobiidae family. It is cavity nester species, living on soft-bottoms in shallow brackish water. The size of mature females and males was respectively 12.65 cm and 13.91 cm total length (TL) at 2.9 and 3.5 years (Hajji et al. 2013). Ninety six specimens of Zosterisessor ophiocephalus were collected during September-November 2012 from the littoral zone using a long handled sweep net (40 cm x 55 cm with a 0.5 mm mesh). Sampling sites were selected in eastern coast of Tunisia (Fig. 1). The industrialized coast of Khniss (35°42’30’’N, 10°49’30’’E), (K), was located in Monastir Bay which is a semi-enclosed lagoon lying on the Eastern shore of Tunisia and does not exceed 3 m depth up to 2 km off the shoreline. This littoral fringe forms a receptacle of multiple wastewater effluents from urban zones. Previous geochemical studies have shown that this littoral is affected by heavy metal pollution (Sassi et al. 1998; Sahnoun 2000). Because of the weak hydrodynamics prevailing in the bay, nutrient-rich wastewaters discharged at numerous points along the shoreline have progressively led to eutrophication (Sassi et al. 1998). A total of 6 bilateral metric and 2 meristic characters were used to assess fluctuating asymmetry: as follows: (1) Length of the pre-orbital distance (labeled "PO"), measured from the mouth to the anterior edge of the orbit; (2) sub-orbital distance (labeled "SO"), measured from the Southern edge of the orbit to the end of the body; (3) orbital diameter (labeled “O”); (4) pre-pectoral distance from pectoral fin (labeled "PP"); (5) length of pelvic fin (labeled "LV"), the length of pectoral fin (labeled "LP"); (7) total number of pectoral fin rays (labeled "NRP"); and (8) total number of pelvic fin rays (labeled "NV") (Fig. 2). Most characters were counted and measured under a binocular dissecting microscope. For specimens too large to fit under a microscope, a magnifying glass was used. Characters were chosen from among those used in previous studies investigating fluctuating asymmetry in fish (Hechter et al. 2000; Lucentini et al. 2002). Like FA, measurement error is often small and normally distributed around a mean of zero (Merilä & Björklund 1995). Measurement error can artificially inflate estimates of fluctuating asymmetry or completely obscure its detection (Palmer et al. 1994) and so care was taken to control for it. All sets of measurements were made exclusively by one person to avoid possible inter-observer variability (Lee 1990; Kozlov et al., 2016). All measurements were replicated ‘blind’ and averaged to the nearest 0.01 mm. Several days elapsed between each complete set of measurements on each fish as this has been shown to give the most reliable estimate of measurement error (Palmer 1994). To assess the relative contribution of measurement error each measurement was repeated two times on each side in 96 individuals. Two-way mixed model ANOVAs were carried out (Palmer & Strobeck 1986) for each trait with the factors ‘sides’ (S) and ‘repeat’ (R) as fixed and ‘individual’ (I) as random. This tests for whether variation between sides is significantly greater than the variation attributable to measurement error. Data were also tested for alternative forms of asymmetry (directional and antisymmetry) and size dependency which can all inflate fluctuating asymmetry estimates (Palmer & Strobeck 2003). Directional asymmetry was tested for by a two-tailed one-sample T-test against a mean of zero. Antisymmetry was tested by examining evidence for platykurtic or bimodal curves in R (Right) – L (Left) scatter plots and running a Kolomogorov–Smirnov test which looks for departures from normality (Palmer & Strobeck 1986). Size dependency, variation of the magnitude of asymmetry due to the difference in trait size (Palmer 1994), was tested for by a Spearman rank correlation between absolute FA (R − L) and the average of both sides [(R + L)/2]. The FA-1 index defined by Palmer and Strobeck (1986) was applied and calculated as the absolute mean difference in length between right and left sides (mean |R − L|). As each pair of measurements was repeated twice, averages of the two estimates were used. FA-1 was calculated both for individuals within each of the populations and across all individuals. We classified individuals into 2 subsamples according to their total length; great individuals group (g), fish with total length exceeding 13 cm size of matured individual (Hajji et al. 2013) and small individuals group (s), fish with a total length less than 13 cm. The FA indexes were compared among the two populations by means of Nested ANOVA test with site (two levels, fixed factor) and size (two levels, fixed factor nested to site). No directional asymmetry or antisymmetry was found in the data. The Kolmogorov- Smirnov test for normality revealed a signiﬁcant departure from normality for LP. However, the distribution was leptokurtic (high, narrow peak), indicating little or no antisymmetry. Antisymmetry can be identiﬁed by a signiﬁcant platykurtic (broad-peaked or bimodal) distribution (Palmer & Strobeck 1986). The leptokurtotic distribution that we observed was similar to that of other studies studying FA of pectoral ﬁns in salmonid ﬁshes (Palmer 1996; Leary et al. 1985). In traits PO, SO and LV, statistically significant size dependency (L–R increases by skull size) was detected and the Spearman correlation a level just below 5%. When normalizing for size, this dependency disappeared and therefore it was decided to work with size normalized FA5 [(L-R)/(L/2+R/2)] in case of those traits in the further analysis. The two-way ANOVA, used to test whether between sides variation was significantly greater than variation due to measurement error, showed that, in most cases, results were significant (P < 0.001) suggesting traits to be repeatable. Differences between the right and the left are distributed around zero for sampling individuals of Chebba (C) and Khniss (K). High mean values of FA were detected in (K) site for O, PO, SO, LV and NV (fig. 3). Chebba population has a low fluctuating asymmetry. Fluctuating asymmetry detected in Chebba is probably due to minor inconsistencies during development such as the quality and quantity of food, extreme temperatures, parasites, diseases and behavioural stress imposed by interactions with conspecifics (Markow 1995). In all characters, mean asymmetry of Z. ophiocephalus from Khniss station were higher than those of Chebba except for prepectoral distance (PP) (Nested analysis of variance; table 1). Khniss station is highly inﬂuenced by the industrial discharges from the industrial zone of Monastir and obvious sources of urban discharges (Dahmane 2000). Previous geochemical studies have shown that this littoral zone is affected by heavy metal as Cadmium and zinc (Sassi et al. 1998; Sahnoun 2000). As a consequence of the weak hydrodynamics prevailing in the bay, nutrients-rich wastewaters discharged in numerous points along the shoreline have progressively led to eutrophication (Sassi et al. 1998) and are probably responsible for the high fluctuating asymmetry. These results are consistent with several previous studies that showed that chemical pollution can lead to high levels of fluctuating asymmetry (Franco et al. 2002; Romanov & Kovalev 2004). These results are not surprising since the chemical and organic pollution causes developmental instability and the presence of heavy metals (Cadmium, zinc) can lead to significant morphological disturbances (Bengtsson et al. 1998). We also detect significant variations for orbital diameter (O) length and pectoral fin length (LV) between small and great groups nested to sites (Nested ANOVA; Table1); for Khniss population, gobies exceeding 13 cm were more asymmetric than small individuals. For Chebba population, no significant differences between those groups for all traits (Tukey test, table 1). It seems that fluctuating asymmetry increases with age since for population of Khniss site, great individuals (older) are more asymmetric than smaller individuals (younger). Two hypotheses may be issued to explain these results. The first one is that older individuals were exposed longer to environmental conditions (pollution in this case), as the animal grows, it loses its stability due to unfavourable conditions (Thiam 2004). The second one is that larger individuals are not just older, but also have grown faster (due to increased nutrients in the sewage of the polluted waters), their faster growth rate at the cost of developing symmetrically (Morris et al. 2012). Fish from Khniss coast are subjected to a different type of environmental stress, which can be detected by the FA, and is probably due essentially to the presence of continuous discharge from local industrial activities and from the wastewater (Sahnoun 2000; Jebali et al. 2011; Annabi et al. 2013). Based on the highest value of asymmetry for the orbital diameter, pelvic fin length and pectoral fin length of grass goby recorded in this study, those parameters could be used as an effective biomarker of stress in the environment. Prepectoral distance, Pre-orbital distance, total number of pelvic fin rays and total number of pectoral fin rays showed lower percentage of asymmetry. It could be assumed that those parameters are less sensitive to change of environmental variables, including pollution. Finally, it is urgent to propose the best management plans to save ecosystems in the Khniss since many deterioration has been detected for Posidonia oceanica meadows (Sghaier et al. 2006) and for animals (Annabi et al. 2013; this study). The first action should be to control the quality of wastewater. It must lead to significant decrease of the discharge of particulate matter and inorganic nutrients in coastal waters. The second solution is to push the current treatment of certain plants to tertiary treatment, which aims to eliminate nutrients (N and P) and heavy metals from water (UNEP/WHO 1996). The third solution is to act on the current discharge to improve the conditions of his release in sea. Move rejection seaward a minimum depth of 15 m to prevent pollution reaching the coast for better dilution and dispersion of pollutants (Quétin & DeRouville 1986). Further dilution of sewage can be obtained by increasing the water depth or the distance of the outfall site. Currently there are rearrangement works at Khniss station, which aims to discharge wastewater farther from the coast and deepen the place of discharge for a better mixing of pollutants. Are these actions sufficient to improve the living conditions of aquatic organisms? Only new research on the composition of water and the biological traits of the aquatic organisms (such as AF) that inhabit this vulnerable ecosystem can give us elements of response. The developmental stability of an organism is reflected in its ability to produce an "ideal" form under specific conditions. A number of studies suggest that development stability would present an inexpensive, rapidly applicable and sensitive stress indicator. In addition, it could be used as an early warning signal or as a tool for regular monitoring of the impacts of human activity on animal or plant species. The most commonly used measure of development instability is fluctuating asymmetry (AF). This study shows that environmental changes may increase the fluctuating asymmetry, which is the result of a deterioration of developmental homeostasis in adult morphology. So that, fluctuating asymmetry can be used to evaluate the effects of environmental stress on animal organisms. Table 1. Nested analysis of variance ANOVA of FA indexes at prospected stations. (C, Chebba station; K, Khniss station; s, small individuals; g, great individuals; n.s., not significant). Fig.3. Mean ± sd of fluctuating asymmetry indexes at sampling stations; C, Chebba; K, Khniss. Fig.1. Map of the study area, showing the sampling stations: C, Chebba; K, Khniss. Allenbach D.M. (2011). Fluctuating asymmetry and exogenous stress in ?shes: a review. Reviews in Fish Biology and Fisheries, 21(3), 355-376. Bengtsson ?., Bengtsson B.E., Lithner G. (1998). Vertebral defects in four chorn sculpin, Myoxocephalus quadricornis L., exposed to heavy metal pollution in the Gulf of Bothnia. Journal of Fish Biology, 33, 517-529. Dahmane I. (2000). Waters geochemistry of the Monastir-Khniss fringe coastline: Pollution by some heavy metals (Zn, Cd, Ni, and Mn). Master thesis, TUNIS II University, Tunisia. Franco A., Malavasi S., Pranovi F., Nasci C., Torricelli P. (2002). 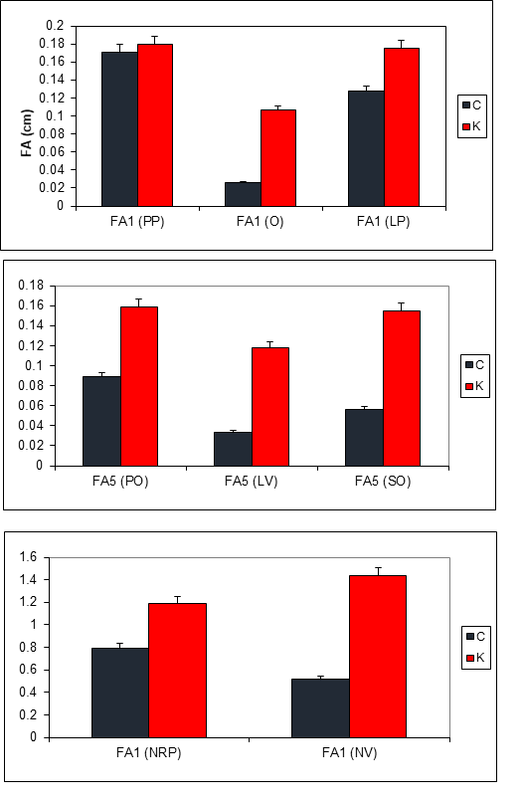 Ethoxyresoru?n O-deethylase (EROD) activity and ?uctuating asymmetry (FA) in Zosterisessor ophiocephalus (Teleostei, Gobiidae) as indicators of environmental stress in the Venice lagoon, Journal of Aquatic Ecosystem Stress and Recovery, 9, 239-247. Hajji F., Ouannes-Ghorbel A., Ghorbel M., Jarboui O. (2013). Age and Growth of the Grass goby Zosterisessor ophiocephalus Pallas, 1811 in the Gulf of Gabes (Tunisia, Central Mediterranean). Acta Adriatica, 54, 27-40. Hechter R.P., Moodie P.F., Moodie G.E.E. (2000). Pectoral Fin Asymmetry, Dimporphism and Fecondity in Brook Stickleback, Culaea inconstans. Behaviour, 137, 999-1009. Lee J.C. (1990). Sources of extraneous variation in the study of meristic characters: the effect of size and inter-observer variability. Systematic Zoology, 39, 31-39. Lucentini L., Lorenzoni M., Panara F., Mearelli M. (2002). Effects of short- and long-term thermal stress in perch (Perca fluviatilis) determined through fluctuating asymmetry and HSP70 expression. Italian Journal of Zoology, 69, 13-17. Markow T.A. (1995). Evolutionary ecology and developmental instability. The Annual Review of Entomology, 40, 105?120. Meril? J., Bj?rklund M. (1995). Fluctuating asymmetry and measurement error. Systematic Biology, 44, 97-101. Morris, M.R., Rios-Cardenas, O. S. Lyons, M.S. Tudor, and Bono, L. (2012) Fluctuating asymmetry indicates optimization of growth rate over developmental stability. Functional Ecology 26, 23-731. Palmer A.R. (1994). Fluctuating asymmetry analyses: a primer. In: Markow T.A. (Eds), Developmental instability: its origins and evolutionary implications. Kluwer, Dordrecht: 335?364. Palmer A.R. (1996). Waltzing with asymmetry. BioScience, 46, 518-532. Palmer A.R., Strobeck C. (2003). Fluctuating asymmetry analyses revisited. In: Polak M. (Eds), Developmental instability: causes and consequences. Oxford University Press, New York: 279?319. Palmer A.R., Strobeck C. (1986). Fluctuating asymmetry: measurement, analysis, pattern. Annual Review of Ecology, Evolution, and Systematics, 17, 391?421. Pottinger T.G., Pickering A.D. (1997). Genetic basis to the stress response selective breeding for stress ? tolerant fish, in: Iwama G.K., Pickering A.D., Schreck J.P. (Eds) Fish stress and health in aquaculture. Cambridge University Press, Cambridge, UK: 171-193. Romanov N.S., Kovalev M.Y. (2004). Fluctuating asymmetry in goldfish Carassius auratus gibelio (Cyprinidae) from some water bodies of the Far East. Journal of Ichthyology, 44, 101-108. Sahnoun O. (2000). Geochemistry studies of heavy metals (Cu, Zn, Cd, Mn, Cr, Ni, Pb and Fe) in the sediments of Monastir bay. Master thesis, Tunis II University, Tunisia: 116. Sassi R., Soussi N., Baccar F., Added A., Charef A., Abdeljaoued S. (1998). Diagnostic environnemental du nord de la Baie de Monastir (Tunisie orientale) par l'?tude g?ochimique des s?diments super?ciels, Bulletin des Laboratoires des Ponts et Chauss?es, 49?58. Sghaier Y.R., Zakhama-Sraieb R., Charfi-Cheikhrouha F. (2006). Status of Posidonia oceanica meadows along the eastern coast of Tunisia, Biologia Marina Mediterranea, 13, 85- 91. Thiam N. (2004). Ecomorphologie de Trisopterus luscus (L. 1758), tacaud: adaptation a la temp?rature et l'asym?trie fluctuante, PhD thesis, department of Ecology and Animal Biology, Universit? de Vigo, Spain: 174. UNEP/WHO (1996). Guidelines for submarine outfall structures for Mediterranean small and medium-sized coastal communities. MAP Technical Reports Series, 112. UNEP, Athens. Wendelaar B. (1997). The stress response in fish. Physiological Reviews, 77(3):591-625.